Elton Long, one of Case IH ’s most influential figures has recently been inducted into the US Association of Equipment Manufacturers’ Construction Equipment Hall of Fame. 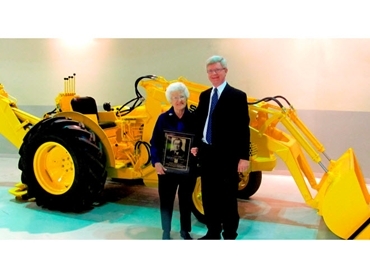 Mr Long, who passed away in 2003 and was recognised as one of the industry’s 100 most significant contributors by the Equipment Manufacturers Institute in 1994, is best remembered for designing and manufacturing the first integrated tractor loader/backhoe. Mr Long was elected to the Hall of Fame by an expert judging board of impartial representatives from major industry associations. Nominees are judges on the degree to which they demonstrate the five guiding principles of the Hall of Fame; corporate citizenship, industry contributions, innovation, leadership, and sustainability. His greatest achievement was leading the team that developed the first factory-integrated loader/backhoe, a machine that provided many advantages over the retrofit approaches of other manufacturers. The first unit, the Case 320, was shipped in 1957 and had a huge impact on both Case IH and the industry. The integrated loader/backhoes enabled contractors to increase productivity, reduce costs and handle more work using less equipment. They were compact and easy to handle in a variety of applications, including jobs previously done by hand. The integrated design of the loader/backhoes accommodated the different types of digging, loading and carrying required of the machines and meant that the machines were tough enough to withstand the stresses of various agricultural, construction and industrial applications. The introduction of the Case loader/backhoes revolutionized their use, where previously typical loaders and backhoes rarely lifted anything heavier than manure and had little digging capacity they could now be used for heavy construction applications.